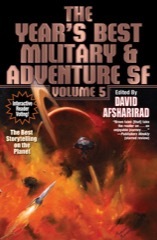 Other anthologies tell you which stories were the year’s best—we’re letting you decide which story from The Year's Best Military & Adventure SF, Volume 5 you liked best. Baen Books is pleased to announce the fifth annual Year's Best Military and Adventure SF Readers’ Choice Award. The award honors the best of the best in this grand storytelling tradition, and its winner will receive an inscribed plaque and a $500 prize. Reward your favorite story, and its author, for excellence! The winner will be announced at Dragoncon in Atlanta, held over Labor Day Weekend 2019, and at Baen.com in the news section. Voting closes August 15, 2019. Entries received after voting closes will not be counted. You may also send a postcard or letter with the name of your favorite story from this volume and its author to Baen Books Year’s Best Award, P.O. Box 1188, Wake Forest, NC 27587.